In this Sept. 25, 2016, file photo, San Francisco 49ers' Colin Kaepernick kneels during the national anthem before an NFL football game against the Seattle Seahawks, in Seattle. Black players in the National Football League have awakened to the realization, that despite their gifts to what has become the nation’s most popular sport, which are substantial, their views aren’t welcome. That was the takeaway from the announcement following the NFL’s recent owners’ meeting, where it was decreed that dissent would not be brooked in the league. What else are they to make of a policy that states that players who wish to bring attention to the rising instances of seemingly sanctioned police brutality towards people of color by kneeling during the playing of the national anthem now have two choices. They can kneel out on the field and face penalties that would be levied against their club, or remain in the locker room while the Star Spangled Banner is played, out of sight of the stadium, with their views remaining out of mind of the audience. Either action would effectively tag them with a scarlet letter and draw the scorn and ridicule of a mindless audience unwilling or unable to refrain from conflating military service with police duties. Understand this: I have family members and lifelong friends who have and continue to wear police shields. I honor them and those who are dedicated to upholding the law without fear or favor, the obligation of any good police officer. But any police officer who has added to the growing list of young, mostly, black men who have been hassled or killed because of the color of their skin deserves to have their conduct examined, up to and including having those shields removed and jail time. 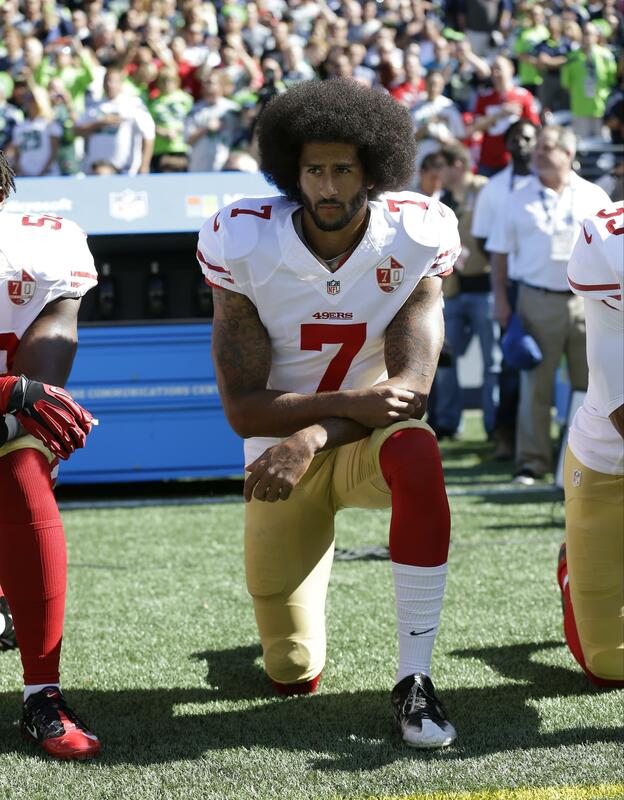 That has been the point that Colin Kaepernick and other black NFL players have tried to raise over the past two years using a platform that the fame that the American culture bestows on them. Kaepernick, an above average quarterback, but not a star, has paid the professional price, for leveraging his stature. He has been effectively blackballed from the NFL, made to watch inferior passers get onto rosters while he sits at home. The facile responses to players who kneel are that they should stick to sports and that they are somehow disrespecting the flag and the anthem. Let’s take those in order. First, what Kaepernick has done, namely use his stature to raise visibility to a cause, is no different than what Houston Texans defensive lineman J.J. Watt has done in raising millions in relief for hurricane victims. You may not agree with the ends, but the means are about the same. And as for the flag and anthem argument, the veterans who have fought for this country, many of whom we honor this weekend for their contributions, including the ultimate sacrifice, did so in most cases for a concept. That idea is that anyone who lives under that flag and who hears the sound of that anthem has the right to speak up when conditions aren’t ideal. If that idea has any meaning, it has to apply to everyone, including to black football players.